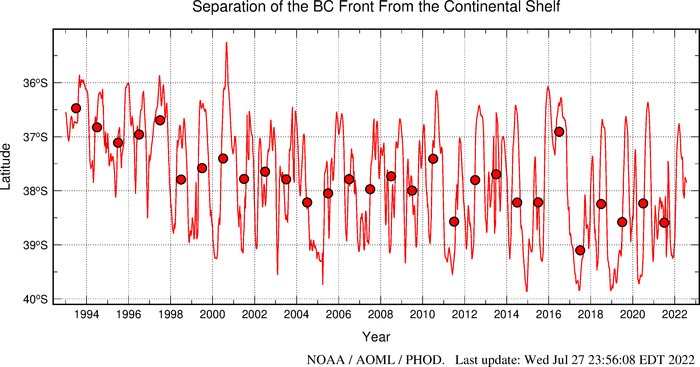 The figure below shows the time series (after a 28-days running mean) of the latitude of separation of the BC front from the continental shelf, defined as the intersection between the -1000m bathymetry contour and the contour when the 10°C isotherm is 200m deep. This time series is updated monthly using delayed-time data (about 6 month delay) and near real-time altimetry data (4 week delay) when delayed-time data are not available. 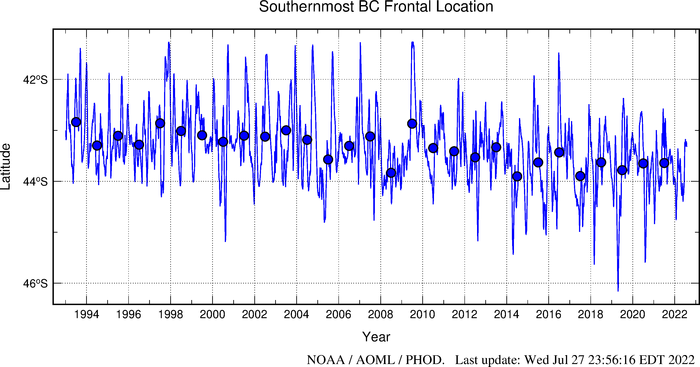 The figure below shows the time series (after a 28-days running mean) of the latitude of the southernmost frontal location defined as the southernmost position of the altimeter derived 200m contour of the 10°C isotherm.